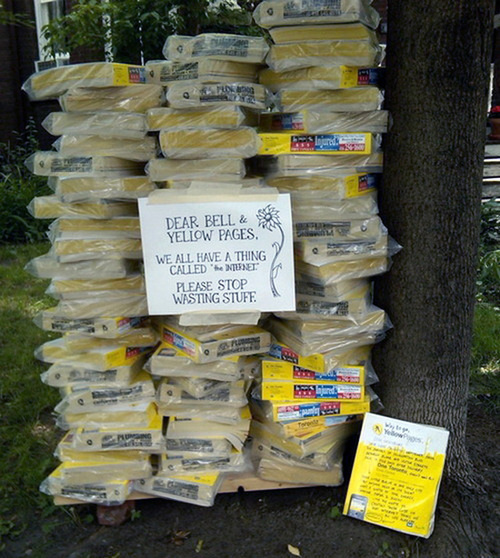 Yesterday, “06880” reported that Westporters can avoid the coming Yellow Book plague by opting out. Today, there’s even better news on the driveway littering front. RTM representatives Liz Milwe, Jeff Wieser and Matthew Mandell have worked for months to make opting out of phone book deliveries easier, more effective — and environmentally friendly. Spurred by Westporter Morgan Mermagen’s 200-signature petition, the RTM members started work on a town ordinance. The Local Search Association — the national lobbying organization for companies like the Yellow Pages and Frontier — heard about the plan. They — and members of those businesses from around the country — came to Westport, to meet with the 3 RTM members. But the talks reached an impasse. So this spring, the RTM reps moved forward with their proposed ordinance. The companies reached out again. Finally — with the help of assistant town attorney Gail Kelly, and following months of conference calls — a deal was struck. All plastic bags used during delivery will be made with 20% post-consumer recycled content. This will be noted on the bag. A new opt-out notice — showing the website www.YellowPagesOptOut.com — will cover 30% of one side of the bag. A letter to the town, announcing a pending distribution by any company, will be done 90 days prior to any event, and 30 days prior to a cut-off for being able to opt out of that (and future) distributions. All books will continue to have a notice on the front cover about the opt-out, with the same URL. Within 14 days after delivery, the distribution company will return through the route, picking up any unclaimed bags within view. A report will be sent to the town each year, noting how many people have opted out. The 3 RTM members will now work with the town and local groups to create a campaign to inform all residents about the opt-out. For more information, contact Milwe (lizmilwe@gmail.com), Wieser (JWieser@hwhct.org) or Matthew Mandell (matthew@westportd1.com). This entry was posted in Environment, Local business, Local politics, Organizations, People and tagged Frontier telecom, Jeff Wieser, Liz Milwe, Matthew Mandell, The Local Search Association, Westport RTM, Yellow pages. Bookmark the permalink. Why doesn’t the City adopt an anti-littering ordinance making it illegal to throw anything from a vehicle onto private property? The books are not litter, they are protected speech according to the courts. And if we called them litter then believe it or not its then the responsibility of the home owner to remove it, not the distributor. .
After nixing home delivery, how about a street-level box/distribution rack by the Library for people who want a printed version. I went to the website to opt out and of course the pre-requisite is to leave your email address. I guess we are trading one form of advertisement for the other. I will put in the yellow pages in the reclycing bin the minute it hits my pavement and will spare myself the influx of emails. They do not sell or use the email addresses. After almost a year dealing with this and the list, I don’t they would never give out anything on that list. Nathalie — if you receive an email from them, there will probably be an “unsubscribe” link at the bottom of the page. Thanks for all the input and questions. I opted out when we began this process in early 2016. I am not aware of any influx of emails as a result. Thank you for the update on the email. I will go back and opt out. Hope this optout really works. I did it this morning, and the site said I would get an email telling me how to verify my choice. I would not be opted out until I verified. Hours later, I have still not received their email. I’m skeptical they will return after 14 days and retrieve any unclaimed books. Wasn’t that what the Minuteman people were supposed to do with their papers? Instead, that damn paper keeps piling up at the end of my driveway. Does anyone know of a way to opt out of the Minuteman delivery? I can tolerate (and recycle) a once-a-year phone book delivery, but this weekly thing is a nuisance. Jack, I may have possibly stumbled on a way to avoid the Minuteman plague: move to a narrow, dead end, private road where it’s kinda hard to turn around. Problem seemingly solved. As a special Summer bonus, the Minuteman’s owner has not yet filed suit against our road association for infringing upon its First Amendment rights. He is responsive…worked on our street. The concessions are great! I doubt YP will pay attn to them. Big Corp over small town stuff? Big corp over site? Let’s press on with the concessions, they’re fair! While this is a great way to avoid a huge annoyance (in years past I can’t tell you how many times I’ve accidentally run over one of these books which is just thrown in the beginning of my driveway), I do have a problem with the fact the website requires you to register and leave some personal information, create another account etc. I don’t care that they say they’re not going to sell the information… Plenty of other companies say the same and then they get hacked, etc. Why can’t they make this easier and relatively anonymous for those who simply don’t want to receive these things anymore? I just opted out and got my verification. Thank you so much Liz, Jeff and Matthew. Once again the same people get stuff done. Aren’t we lucky to live in the same town as the three of you and to have06880 and Dan to get the word out! Don’t know why anyone would complain on this one! I forgot to ask, anyone know how to opt out from all the catalogs and junk mail that goes directly into the recycle bin? Thanks Bobbi. I used http://www.catalogchoice.com in the past. It might have worked for a while, but they seem to find different names/titles to open new accounts and the same number of those things pile up in the mailbox. I think the only way is never to buy ANYthing online….